In the media industry, we often see that the old world just won't let go. The obvious sign is when traditional media are behaving in ways that digital media never would. Last week, the BBC announced they are launching a new digital space, with the launch of a much improved the African edition of the BBC website. 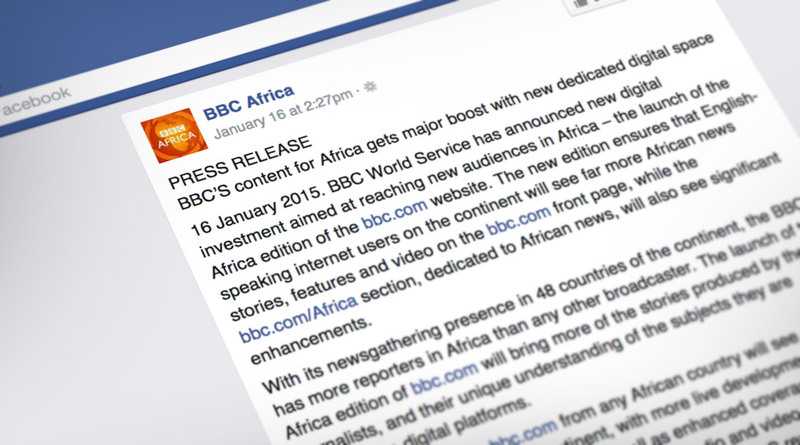 "The BBC will also continue to give a voice to Africa's massive online audience via dedicated space on social media such as Facebook, Twitter, Google+, Instagram, SoundCloud and YouTube." That's great news. We need a more authoritative voice for Africa. But if you follow the link to their announcement, you will find a PR article that is missing any forms of links to any of the things they are trying to promote. In other words, they are launching something new online, but they are not linking to it. You might say that this is not that big of a deal, and you are right. Most of this announcement deals with how their website will be geo-targeted to promote better stories when people visit from Africa, but this illustrates a cultural problem. Can you imagine any digital native publisher announcing something new, and even pointing to their social channels, without also linking to pretty much anything they can link to? Linking and connecting is in the very blood of a digital native. Without the link, the article looks incomplete. In fact, the whole point of posting such an announcement is to create a connection. This seemingly simple problem is such a fundamental issue in the traditional media world. You are not connecting with your audience. You are just doing old world PR. Another thing. When you read the announcement, we see the traditional 3rd person type of reporting. Instead of having the people in charge tell the story directly to the readers, it's is being presented as a third party interview. Instead of saying "We are proud to announce...", they write "BBC World Service has announced...". Instead of having the story authored by Dmitry Shishkin, Group Digital Development Editor and BBC Africa Editor Solomon Mugera, the posts is interviewing them as if they are working at a different company. Think about it like this. If a brand were to announce a new product, which person would you rather hear it from? The CEO herself, the designer who made it? ...or via a 'report' by a 3rd party PR person? The answer is obvious. You want to hear it from the person as close to the action as possible. Why would you want to listen to an announcement through a third party? This is a disease that exists in the traditional media world. You are adding layers of reporting and artificial boundaries between the readers you want to connect with and the newspaper. You forget that you have to be a part of the very world you write about. Some of you might say that I'm wrong, because this announcement was posted on the BBC Media Center, and as such is targeted other journalists. And the writing is reflecting that by making it easy for other journalist to copy/paste the snippets into their stories. All of this is true, but this also illustrates another problem. The BBC isn't exactly a media company that lacks reach. It's one of the largest media companies in the world. So, why is your launch strategy to post a non-linked, PR release for other journalists? Not could I find any announcement of this over at the BBC's main pages. This is a very important announcement that represents a significant increase in focus. Why aren't you telling your readers about it? I went to BBC News, and even to BBC.com/Africa and I could not find even one mention of it. You are not thinking about your media company as a brand that is delivering a product to people. You still think of it as an institution where the reader is just something that magically appears through scarcity of information. Connect with your readers. They are right there in front of you. Don't launch something by posting it as a press release for other journalists. The only place I could find where this was actually announced were on the BBC's Africa Facebook page... and do you know what that look like? Yep, they just reposted the press release. I don't want to see a freaking press release. I want to hear the news from you! I want Solomon Mugera, BBC's Africa Editor, to come out and post this himself. It seems like a small thing, but this illustrates a fundamental lack of a proper digital culture. No digital native would ever announce something new this way. Ever. So... I took the liberty of rewriting the press release, and turn it into a real post that you would write to connect with your real readers. I have some really great news for you today. Here at the BBC, we have decided to significantly improve our focus on Africa. We will do this with a brand new edition that is dedicated to African news, just for you. You will see far more stories, more features, and more video about your region, all coming from our 48 offices across Africa. It will be stories written by our many wonderful BBC journalists who are living in your area, and sharing your culture and concerns. We will focus more on live developments, moving news, and sport, to bring you stories and insight that is more relevant to you, here and now. And, we will draw upon a our wealth of expert reporters, to give you far more in-depth stories, with a balanced portrayal of the vibrant African continent that we all know and love. Here at the BBC, we have seen a tremendous and incredible growth in readers from Africa, especially via mobile phones. Africa is such an amazing place when it comes to mobile. So much that many of the things we see with mobiles in Africa is something the rest of the world could learn something from. The future of how the people of Africa are going to connect, stay informed, and communicate with each other is truly remarkable. We can already see this here on the BBC where we have experienced a 40 percent growth year over year, with over half of you using mobiles to read our stories. We want to make sure that we serve the best experience on mobile, and on all the other devices you might have. And not just by doing it on mobile, but by doing in the African way. We have also decided to increase our focus on how we connect with you every single day, on all our many social channels such as Facebook, Twitter, Google+, Instagram, SoundCloud and YouTube. We love the community we have together on these channels, and we want to make that even better. We want to make this place where we can connect with each other, where we can keep you informed, and as a place where you can have a voice of your own. We don't just want you to read our stories. We want the stories to connect with you. We want you to use our stories to help you transform Africa into something even better. Most of all, we want to bring you this content in an even more relevant way. While this new African Edition will be mainly focused on our English speaking audience in Africa, we will continue to provide you with language specific news via the BBC World Services. The BBC World Services connects you with news across a wide variety of methods, including TV, radio on FM, shortwave and satellite, online and mobile devices and social. The language websites - bbcafrique.com (French for Africa), bbcarabic.com, bbcgahuza.com (Kinyarwanda/Kirundi), bbchausa.com, bbcsomali.com and bbcswahili.com - provide you with news, information and analysis in text, audio and video. We also have TV broadcasts like 'Focus on Africa', which is presented by the two wonderful Sophie Ikenye and Peter Okwoche. We have 'The African Business Report' presented by Lerato Mbele. And, not to mention, BBC Swahili's Dira ya Dunia with Salim Kikeke. We believe in Africa, and our promise to you now is to take that up a notch. To increase our focus on your world even further, and to offer you even more exciting, fresh and dynamic stories. This is our promise to you. Thank you!